"Tippins displays her gallery of grotesques with the skill of a ringmaster showing off performing fleas, and her affection for her subjects rises from the pages like the scent of joss stick." "The Queer Creative Impulse: Artistic Expression and Gender Identity"
Join us for a discussion on the intersection of LGBTQ identity and creativity. Hugh Ryan, curator of the exhibition On the (Queer) Waterfront, and author of the new book When Brooklyn Was Queer, is joined by historian and CUNY professor, Daniel Hurewitz, author of Bohemian Los Angeles whose work focuses on the development of gendered and sexual identities, and Sherill Tippins, author of the book February House about the salon/house described by the queer platform, them, as “the Queer Commune in WWII Brooklyn that became a cultural epicenter.” Moderated by the senior managing producer of the Slate Podcast Network, June Thomas, founder of Outward, Slate’s LGBTQ section. How artists helped to inspire queer activism is just one of the many topics that will be explored. 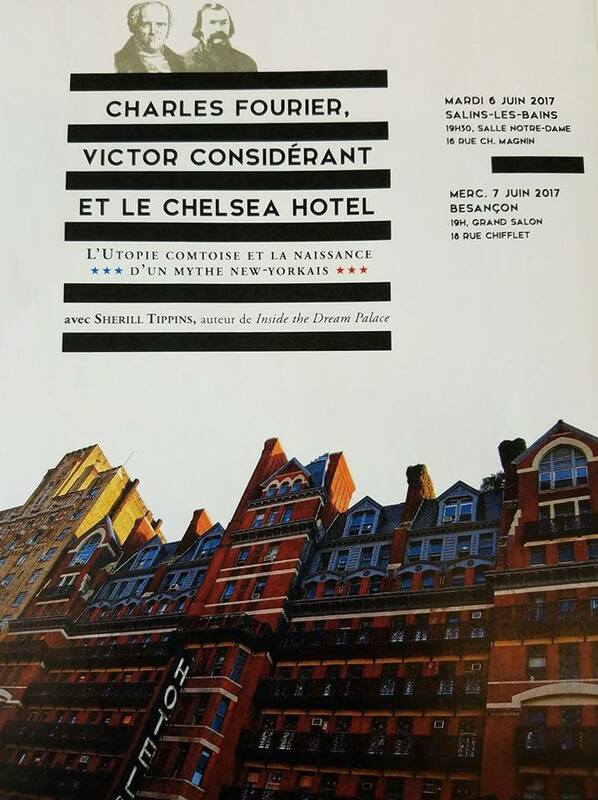 ​"Charles Fourier, Victor Considerant et le Chelsea Hotel: L'Utopie Comtoise et la Naissance d'un Mythe New-Yorkais"
The story of the Chelsea Hotel's origins, in English and French. her work-in-progress, The First Two Hundred, the story of the first European settlers on Manhattan Island, creators of the culture that is the city of New York. of Hotel Chelsea resident composer Gerald Busby's 80th birthday celebration. With pianist Malcolm Martineau, pianist Michael Broffman, soprano Martha Guth, and baritone Michael Kelly. Jesse Blumberg, moderator. R. R. Smith Center, Staunton, VA. The Chelsea Hotel: A panel discussion with preservationist Edward Kirkland and Ed Hamilton, author of Legends of the Chelsea Hotel..